Red Clover Burdock Plus 4 fl. oz. Blood, Lymphatic and Glandular Alterative. These herbs were used by the renowned herbalist Harry Hoxsey. They are considered by herbalists to be classic alteratives, traditionally known as blood purifiers. They are believed to enhance metabolic functions and help promote better elimination through the eliminative organs, leading to a better absorption and assimilation of nutrients. Ingredients: Organic Red Clover Blossom, Organic Licorice Root, Wildcrafted Buckthorn Bark, Organic Burdock Root, Wildcrafted Stillingia Root, Organic or Wildcrafted Poke Root, Wildcrafted Oregon Grape Root, Wildcrafted Prickly Ash Bark, Wildcrafted Fresh Wild Indigo Root and Organic Bladderwrack. Suggested Use: 15 to 30 drops in a small amount of water 2-5 times daily between meals. Not recommended if nursing or pregnant. Warning: If you are pregnant, may become pregnant, or breastfeeding, or taking any medication, consult your health care professional before using this product. Actions: Antineoplastic, alterative, depurative, expectorant, antispasmodic, antiseptic. Common Use: A very useful remedy for skin problems, especially safe for children, it is also commonly used in the therapy of chronic skin problems such as psoriasis. The expectorant and anti-spasmodic action of red clover make it a natural alternative for coughs and bronchitis, and especially in whooping cough. 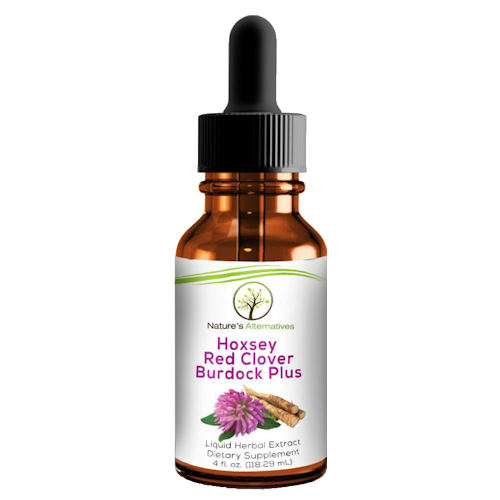 As an alterative with exceptional blood cleansing properties, red clover is indicated in a wide range of problems when approached in a holistic sense. This herb is also included in the Hoxsey formula. Actions: Expectorant, demulcent, anti-inflammatory, adrenal agent, antispasmodic, mild laxative, alterative, antibacterial, antimicrobial, antitoxic, tonic, pectoral. Common Use: In China, licorice root has been called "The Great Detoxifier." It acts on the endocrine system and the liver as an anti-hepatotoxic. Also as an expectorant and anti-inflammatory it may be useful in coughs and bronchitis. A recent study found that licorice root actually stimulates the production of interferon, that critical chemical in the immune system that could benefit the body in response to many immune response deficiencies. Licorice root also possesses estrogenic activity, and is said to be beneficial as a uterine tonic and to induce normal ovulation. This herb is also included in the Hoxsey formula. 5 to 30 drops 2-3 times daily. Caution: Excessive and prolonged use of licorice root can cause sodium retention and potassium depletion. Potassium supplementation (75-100mg daily) prevents this problem. Not recommended if nursing or pregnant. Actions: Laxative, diuretic, bitter tonic, alterative, cathartic, hepatic. Common use: This herb is a mild and yet reliable laxative, stimulating the action of both the stomach and bowels very favorably. Also as a bitter tonic to ease digestion. Do not exceed dosage. Not recommended if nursing or pregnant. Actions: Alterative, depurative, diuretic, bitter, tonic. Common Use: This root is well known for its blood cleansing properties and is used in innumerable herbal medicines and blood remedies. Experiments on burdock have shown it to lower blood sugar, and destroy fungal and bacteria cultures. Japanese researchers at Nagoya University found in burdock (aka Gobo root in Japan) a new type of desmutagen, a substance that is uniquely capable of reducing cell mutation in either the absence or the presence of metabolic activation. This new property is so important, the Japanese scientists named it the B-factor for "burdock factor." In general, it is claimed burdock will help restore the body to a state of integration and health. Burdock is also included in the Hoxsey formula and Rene Caisse's Essiac formula. Actions: Alterative, depurative, expectorant, diaphoretic, sialagogue, astringent, antispasmodic. Common Use: This plant is an excellent alterative acting primarily on the lymphatic and secretory systems. American Eclectic physicians in the 19th century used it in cases in which an alterative could be recommended. Another area of application is in bronchitis and laryngitis, especially where it is accompanied by a loss of voice. As an astringent it may be used in a number of conditions, but especially for hemorrhoids. This herb is also included in the Hoxsey formula. Actions: Alterative, emetic, antirheumatic, stimulant, anticatarrhal, purgative, tonic. Common Use: Poke root has a wide range of uses and is a valuable addition to many holistic remedies. The root has a very favorable influence on the glandular system, inciting and increasing its action. It regulates the liver and bowels and cleanses the blood and is therefore highly valued in conditions due to impurities in the blood. It is often used as a remedy for upper respiratory infections, coughs, tonsillitis, laryngitis, swollen glands and mumps. It is an excellent aid in cleansing the lymphatic glands throughout the body and is especially helpful in mastitis. Poke root also has a use in rheumatism. This herb is also included in the Hoxsey formula. CAUTION: In large doses Poke root is a powerful purgative and emetic (causes vomiting). Use With Care. Not recommended if nursing or pregnant. Actions: Alterative, hepatic, cholagogue, laxative, anti-emetic, anticatarrhal, tonic. Common Use: Oregon grape is similar in action to golden seal and barberry (they all contain berberine). It acts as a tonic on the liver and gall bladder and can be useful in chronic and scaly skin problems, which can be caused by systematic imbalances. Also known to be helpful for stomach and gall bladder conditions, especially where there is associated nausea and vomiting. This herb is included in the Hoxsey formula. Actions: Stimulant, tonic, alterative, carminative, diaphoretic, sialagogue, febrifuge. Common Uses: Prickly ash may be used in a way that is similar to cayenne, although it is slower in action. It is used in many chronic problems such as rheumatism and skin diseases. Any sign of poor circulation can be benefited by the use of this herb, chilblains, cramp in the legs, varicose veins and varicose ulcers. Due to its stimulating effect on the lymphatic system, circulation and mucous membranes, it will have a role in the holistic relief of many specific conditions. This herb is also included in the Hoxsey formula. Actions: Antimicrobial, anticatarrhal, alterative, febrifuge, antiseptic. Common Use: Wild indigo is an herb to be considered wherever there is a focused infection, especially infections and catarrh in the ear, nose and throat. It may be used for laryngitis, tonsillitis, pharyngitis and catarrhal infections of the nose and sinus. Taken internally and as a mouthwash it will help with mouth ulcers, gingivitis, and in the control of pyorrhea. Also used effectively to treat enlarged and inflamed lymph glands, the action of this plant exerts a vital influence, aiding in metabolism by stimulating the elimination of accumulated waste in the body and encouraging normal organic activity. This herb is also included in the Hoxsey formula. Use With Care. Better long term in formulas. Actions: Alterative, antirheumatic, antibacterial, antibiotic, cardiac tonic, antioxidant. Common Uses: One of the richest sources of micro-nutrition, minerals, and trace minerals, kelp is especially high in iodine and potassium. It has proved most useful in the relief of underactive thyroid function and for alkalizing blood chemistry. The extensive research done on this remarkable seaweed has shown it to have antibiotic, antioxidant and antibacterial properties. Kelp also has the ability to protect against environmental toxins, increase circulation and help lower cholesterol, among other benefits.